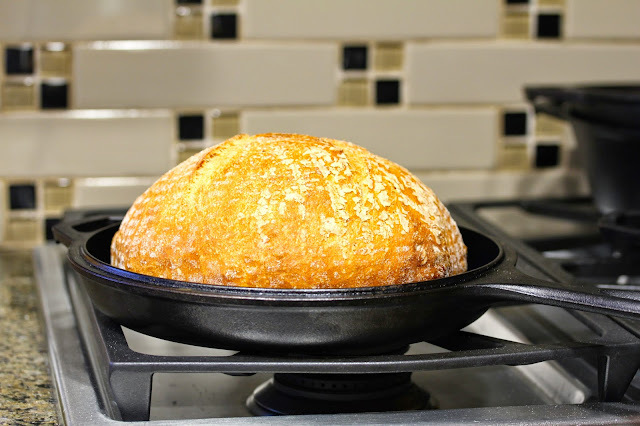 Baking bread in a cast iron or clay pot is a great way to recreate the hot, moist environment of a professional oven. The super hot pot traps the steam that is naturally generated from the dough, and also encourages the dough to rise rapidly in the oven. This is called "oven spring." The bread in the photo above was baked in a cast iron pan that was preheated in a 500 degree (F) oven. I've posted lots of bread recipes that use this method so I finally decided to take some photos demonstrating how I do it. I've seen plenty of videos where bakers transfer the loaves to the hot pots with their hands, however, when I tried it, I managed to either drop the dough, deflate it, or burn my hands. I finally settled on this method of transferring the dough. It has worked beautifully for me. I hope you find this helpful! 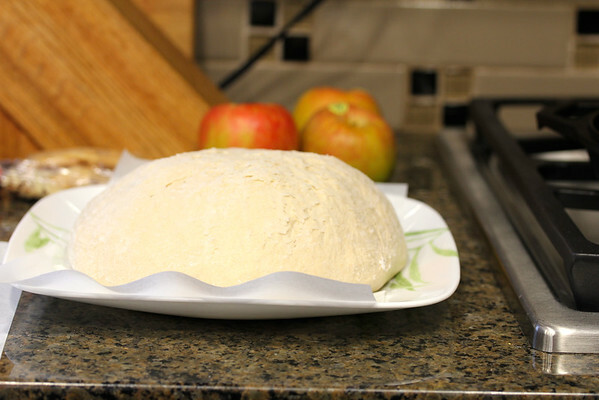 The photo above is of the dough after the second rise (I used a plastic banneton for this bread). 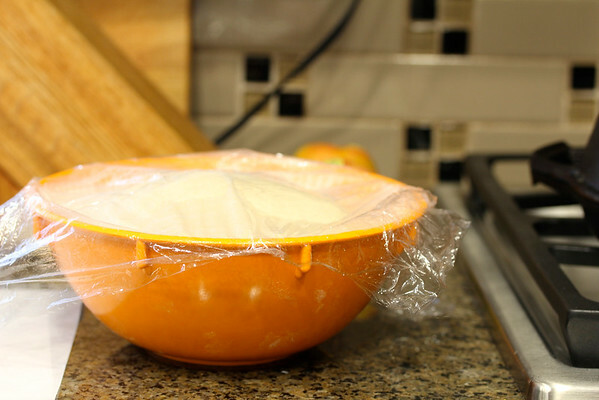 First, remove the plastic wrap, and top the dough with a piece of parchment paper. Then top the parchment with a dinner plate, and then flip the whole contraption over. Next, lift off the banneton. 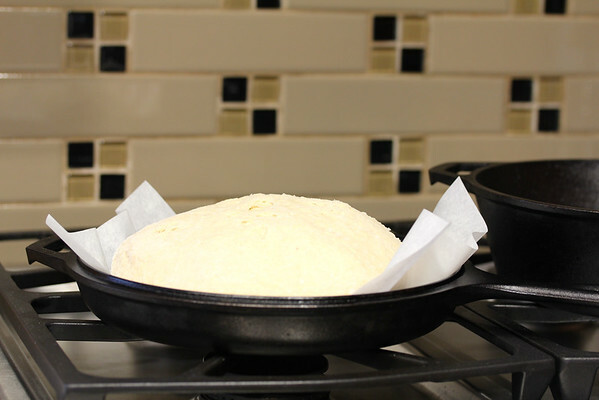 and move the dough to the hot cast iron pan by lifting up the parchment paper. If you are scoring your dough, do it at this point. 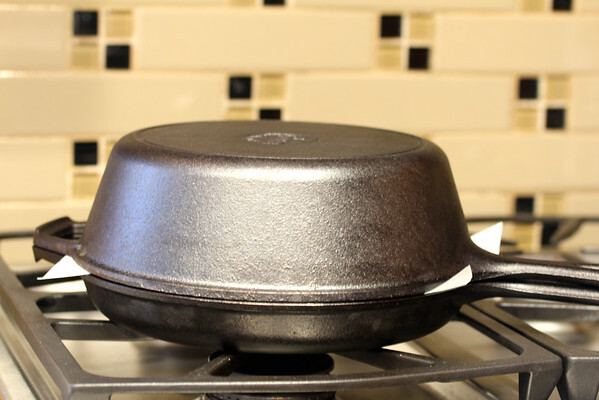 I usually use an inverted Lodge Cast-Iron Combo Cooker(the top is a frying pan), but any hot cast iron or clay Dutch oven will work just fine. For oblong loaves, I use an oval Dutch oven. 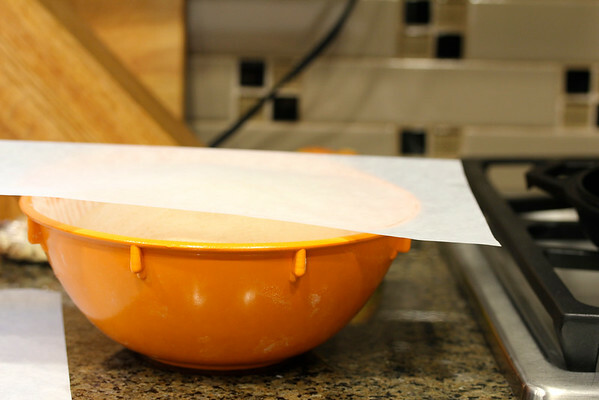 Use good quality thick parchment paper, such as Reynolds or King Arthur Flour. 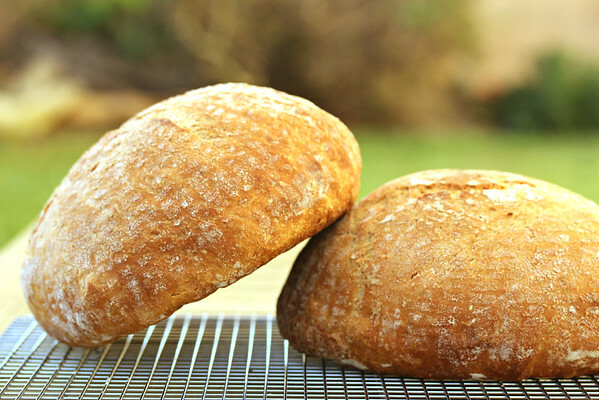 The first time I tried this, I used a thinner parchment, and I had to scrape it out of the bottom of the bread. Also, remember that the pot is screaming hot, so use good potholders or oven gloves. 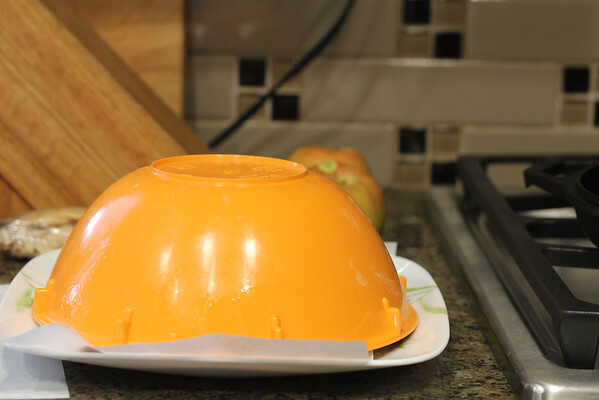 Finally, cover the dough with the top, and immediately place it into the hot oven. Depending on the recipe, you may reduce the oven temperature to 450 to 475 degrees F. After the bread has baked for about 20 minutes, remove the lid of the pan and continue to bake the loaf for the full baking time. I usually remove the whole pan from the oven and transfer the loaf to a baking sheet by lifting the parchment paper, and then returning the loaf to the oven on the baking sheet. I do this to prevent burning on the bottom of the loaf. There are many more in my recipe index. I managed to either drop the dough, deflate it, or burn my hands. I managed to drop the dough, deflate it, AND burn my hands. I now use about the same method you do, although I never baked in a cast iron pan, should try that sometime - I use a roaster with a lid. Using parchment to cook with is an interesting idea, and certainly nothing I would have ever thought to do. I wouldn't have thought it would be a good idea, and not because of what happened to you when you used the thin paper. Interesting that it actually seems to work with you, I may try this the next time I make bread. I certainly like this idea. I just started using my cast iron skillet and made a cobbler. I don't have a lid for mine so maybe I'll have to buy one with a lid. The texture of the bread looks perfect! Hi Linda, the Lodge Combo Cooker is perfect for this! I just bought that pan!! My bread stuck so badly yesterday i lost the entiire bottom crust!! I am definitely doing it this way from now on!! Thanks!